Rockcliffe Grange is an exceptional new development comprising a range of 4 & 5 bedroom homes of striking contemporary design, positioned in a highly favoured suburban location off Nottingham Road easily accessible to numerous facilities. Showcasing high end finishes and classic design features throughout, these generously proportioned homes with garages will suit families and couples alike. With good links to the M1, Mansfield and Nottingham City Centre, this truly is a great location which has it all. Plot 45 Type D 'Park Lane'. A spacious four bedroom detached house with accommodation extending to approximately 2,012 square feet. 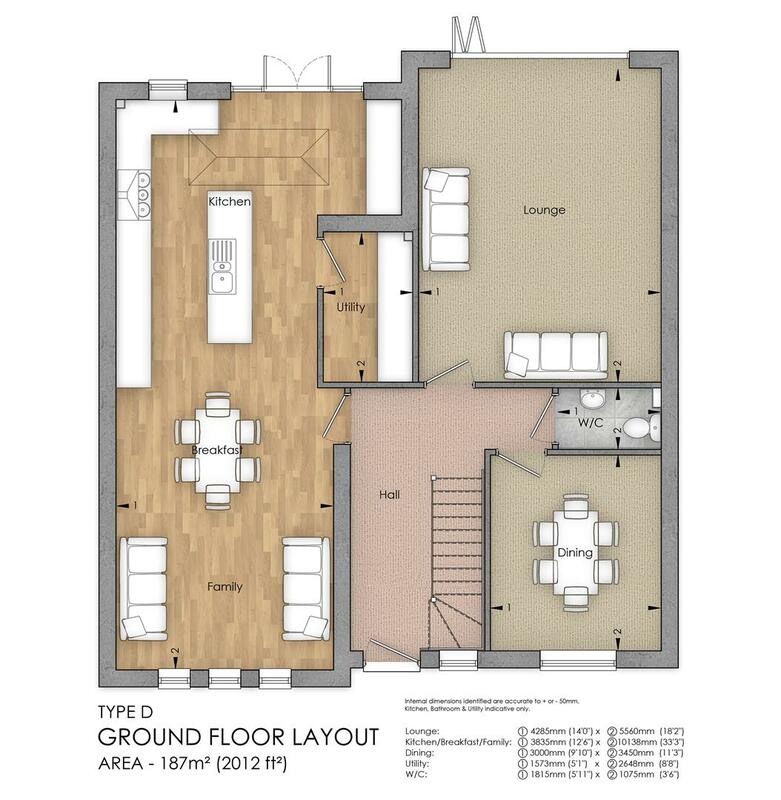 On the ground floor there is an entrance hall, cloakroom/WC, utility, separate dining room/study, lounge and a substantial open plan living space with an orangery roof to the kitchen section and bi-fold doors leading out onto the rear garden. 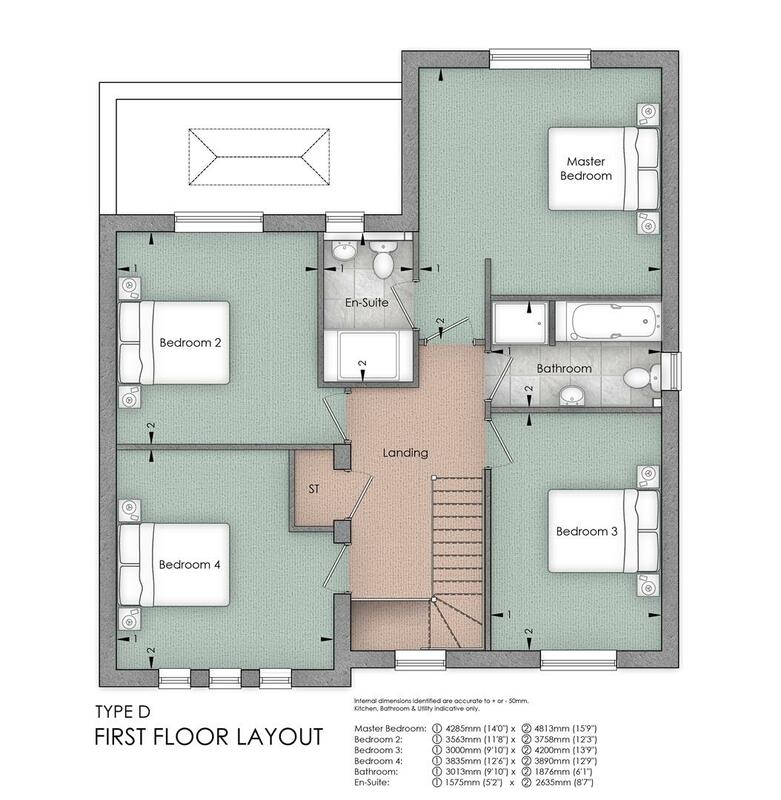 The first floor galleried landing leads to a master bedroom with an en suite, three further double bedrooms and a house family bathroom comprising a four piece suite. Plot 45 stands at the end of the development on a generous sized plot benefiting from a south facing rear garden, driveway, single garage and landscaped gardens to the front and rear. Overall, this is a fantastic opportunity to be part of Mansfield's latest residential new homes development with prices ranging from £365,000 - £475,000. For further information and to reserve a plot please call Alistair Smith, Director at Richard Watkinson and Partners on 07817 283 521. Local Area - Mansfield is the largest town in Nottinghamshire with a variety of leisure and retail facilities and is also serviced by excellent road and rail links. The market square is a large commercial centre surrounded by a museum, The Palace Theatre and a number of pubs, bars and nightclubs that combine to provide a wide range of entertainment for both day and night. So, whether you're looking to dine out or have a few drinks with friends there's something for every taste. Mansfield has excellent road links and can be reached within around 10 minutes of Junction 27, 28 and 29 of the M1, and is also situated around 18 miles from the A1 at neighbouring Newark-on-Trent. Recent improvements have seen rail services to Mansfield grow with the town being one of the main stops on the Robin Hood mainline which runs between Nottingham and Worksop. Nearby Sherwood Forest and Clumber Park are excellent places to visit for activities such as cycling, walking, and family days out. The town is also ideally located for several golf courses, including Notts (Hollinwell) and Sherwood Forest golf clubs. Nottingham National Water Sports Centre provides a great day out for everyone, whether you're looking to take in a show at the Royal Concert Hall or engage in a little retail therapy in the city packet with shops. Nottingham is a city steeped in history with popular attractions such at the city caves, castle and the legend of Robin Hood. Mansfield is an up and coming town with a number of improvements currently underway around the town. Building & Shell - . Modern red brick and buff brick with front elevation slate detailing.
. Sealed UPVC double glazing. Kitchens - . Choice of beautiful bespoke kitchens.
. Luxury top brand kitchen appliances.
. Work surfaces and tiling from a choice of high quality materials.
. All designed in-house to compliment and indulge your individual tastes. Bathrooms - . Contemporary bathroom fittings.
. Choice of extensive contemporary tiling range.
. Electrical extractor fans for bathrooms. Internal & External Decoration - . Modern internal and external feature doors with chrome fittings.
. Fitted wardrobes to main bedroom only.
. Choice of quality carpets throughout. Economy & Comfort - . Full gas central heating (ground floor underfloor heating to all plots). Security & Peace Of Mind - . 10 year Global Home Warranty.
. Mains operated smoke and CO2 detectors.
. Full security alarm system.
. Cat 6 cable installed to each TV point. External Landscaping - . Professionally landscaped gardens.
. External power point and water tap.
. Good sized garage (single or double dependent upon individual plot).